Earlier this week while eating lunch at home, I happened to catch sight of a large red-tailed hawk. Hawks are one of the ways angels communicate with me. Maybe because my last name is often pronounced hawk, I have come to regard them as a powerful messenger. This magnificent bird landed in our next door neighbor's yard. He perched on the linked fence, facing the street, observing his surroundings with a keen eye. I grabbed my binoculars to admire his beautiful markings. With his back to me, I watched from the dining room window. What was the message? Often I see hawks in flight, but rarely does one make such a deliberate appearance. Watching the hawk on the fence, I suddenly got the personal message: Hawks for Lunch. Satisfied that his mission was complete, he spread his wings, off to deliver another message. In the mid 90's, with 20 years of government service, little did I know that a hawk at lunchtime would change the course of my life. But it did... I let go of everything familiar to begin a brand new chapter. Guided to work on an angel production for television, it took Hawks for lunch, the amazing synchronicity to stretch beyond my intellect and follow a nudge into uncharted waters. Something I never regretted. Hawk awakens our higher vision so we can spread our wings and inspire others to do the same with their creative life's purpose. There's a stirring in the ethers, a call to come up higher. With half of 2018 completed, it will be interesting to watch as events unfold. 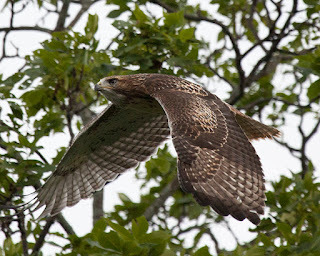 Like hawk, we can circle above, and see things from a higher perspective before taking action. Or we can stay on the fence... Either way, get ready an opportunity is heading your way.